Madden 2004 was an iconic game. Unleashing a Michael Vick with 95 speed and 97 throw power revolutionized the game so much that EA Sports had to spend the next 12 months focusing solely on the defensive side of the ball in Madden 2005 to counteract it. Introduced in Madden ’05, the “Hit Stick” has since become a staple and is a move every gamer has packed in their arsenal when playing. One of my favorite, less-heralded features of Madden ’05, though, was the introduction of position battles in franchise mode. This new feature allowed you to watch up to three players jockey for depth chart positions during the preseason. After accruing stats throughout the four weeks of preseason, winners were declared by whichever player posted the best statistics. It was meritocracy to the nth degree. It rewarded players based on their on-field play, putting aside contract situations and draft capital, and letting a player’s performance speak for itself. Fast-forward to 2018, and while teams don’t necessarily ignore contracts and draft capital, they still continue to let players duel it out in the preseason. The 2018 preseason is shaping up to surely have its fair share of training camp battles for us to watch. Over the next couple weeks we’ll break down some of the most intriguing battles to watch during training camp and into the preseason. Unfortunately at the quarterback position, there isn’t quite a lot of uncertainty at this point. Most of these battles have favored veterans over the unproven rookies to date, but things can change quickly in the NFL. At the finale of the Browns’ last minicamp practice, new OC Todd Haley dropped this valuable quote saying, “I’d say it’s clear that Tyrod is the leader of this team.” While we can argue semantics of whether he meant Taylor is the quarterback of this team or just a leader, it sets up the Browns’ early depth chart with Taylor as the projected starter. It’s not difficult to see why Haley has Taylor at the top. Over the last three years, 20 quarterbacks have had at least 1,200 dropbacks. No quarterback has thrown fewer interceptions in that many throws than Taylor. An offense that stays on the field is a lot more valuable to an OC than one that is consistently shuffled off the field due to turnovers. While Taylor’s been a far more successful fantasy quarterback than real life one, it’s difficult to ignore what he was able to do with a Bills squad last year (our No. 14-graded QB) that tried to sabotage him at every turn with their mass exodus of talent. The offensive weapons at Taylor’s disposal in Cleveland are by far the deepest he’s ever had to work with. If Taylor gets the starting nod, he could put up some serious fantasy numbers throwing in conjunction with his rushing ability. Selected first overall, Mayfield’s time on the bench may be limited. As noted by TwoQB’s Greg Smith, quarterbacks drafted within the top-10 have started 12.4 games their rookie season over the last decade. That number jumps up to 13.5 when looking solely at No. 1 overall picks. The heat will be on from the get-go for Taylor with every mistake heavily scrutinized by a fan base that will be calling for the team’s first overall draft pick to see the field. Mayfield’s final year at Oklahoma was one of the best ones we’ve ever tracked during the PFF era. He led all quarterbacks in passer rating under pressure (111.6), passer rating within a clean pocket (143.8), and passer rating off play-action (115.8). He was third in deep-ball passer rating (127.9), showing a well-rounded individual that was well warranted with the first overall pick. Mayfield should have little difficulty translating these skills to the next level and will keep the pressure on Taylor. 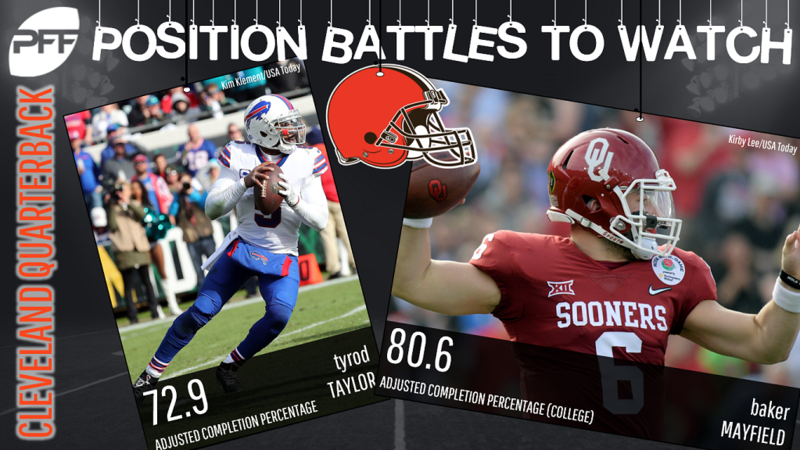 While Taylor looks to be the early odds-on favorite to land the starting gig, don’t be surprised if the Browns repeat history and start Mayfield sooner rather than later. The 38-year-old McCown set career-highs across the board last year with the Jets before a broken hand prematurely ended his season in Week 14. Let me reiterate that for a brief second. After playing in the league for 15 years, McCown had the best campaign of his career despite playing in only 12 and a half games. His adjusted completion percentage (taking away drops, spikes, throwaways. Etc.) ranked fourth among all quarterbacks last season (76.5). He supported two top-13 wideouts in our WR rating from Week 1 to 13. It’s no wonder the team gave him every first-team rep throughout minicamp. Rookie Darnold is hot on McCown’s heels. New OC Jeremy Bates (promoted from quarterbacks coach) is throwing everything in the playbook at the rookie giving him a trial by fire. He’s responded well so far according to minicamp reports and unlike the Browns’ situation, this could be a bit more of an open competition. 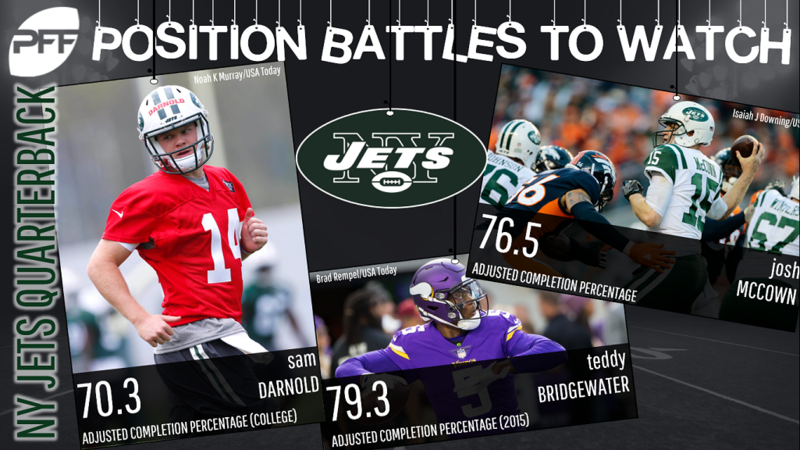 Darnold still needs to fine-tune some of the nuances of the game — notably working on calling plays and reading defenses with pre-snap looks — but the third overall pick should make this an exciting QB battle to watch. Look for this battle to continue all the way through training camp and to the final week of the preseason. You have to have some sympathy for Bradford. He’s entering his sixth different offense in nine years in the league. His health has held him to playing just 80-of-128 games — that’s three full seasons worth of games he’s missed. The bright part for Bradford is that his last stop in Minnesota — 15 games in 2016, 2 in 2017 — featured one spectacular season (’16) before a knee injury ended his 2017 season early. Bradford’s 2016 campaign was one that should give the Rosen backers some pause before anointing the rookie as the starter. That year, Bradford posted the highest adjusted completion percentage (80.9 percent) of the last decade. He sported the second-highest passer rating under pressure (87.7) and the third-highest passer rating on deep passes (121.5). He should come in and immediately work wonders with underneath options in Larry Fitzgerald in the slot and David Johnson out of the backfield. While Bradford continues to rehab his knee and the team progresses him slowly, Rosen is getting in some valuable first-team reps. The 10th overall pick has looked impressive to date, throwing well and showing good decision-making and reads. The buzz around Rosen has made it look like he’s the clear No. 2 ahead of Mike Glennon, with an outside shot of getting the starting gig. HC Steve Wilks has repeatedly reminded that while it’s an open competition, Bradford is currently the starter. The bottom line is that while Rosen has impressed, the team looks like it has every intention of Bradford starting Week 1. The Cardinals don’t have their bye until Week 9. They return Week 10 for a matchup in Arrowhead Stadium against the Chiefs — a tough place for a rookie quarterback to get his first NFL start. The starting job could remain Bradford’s for the entirety of 2018 if health allows it. This is easily the most wide-open competition we’ve reviewed here. Buffalo signed McCarron this offseason to a two-year, $10 million deal this offseason. He looks like he’ll have the early nod as the starter, but all three quarterbacks will get turns with the first-team offense when training camp opens. Unfortunately, we don’t have much statistically to gauge on McCarron. He’s completed fewer than 100 passes as a backup quarterback, with most of them coming in 2015. However, he did perform rather well in limited action that year, completing 66.4 percent of his passes with a 5.0 percent touchdown rate. Another promising thing was that he wasn’t timid with the ball. Nearly 44 percent of his throws went to downfield targets in A.J. Green and Marvin Jones, as McCarron finished that year with an 8.9-yard average depth of target. McCarron won’t be handed the job, but early reports have him penciled in as the starter. The No. 2 position looks like Peterman’s to lose at this point. The five-interception game will be all that most remember about Peterman’s unspectacular rookie season, but it wasn’t that long ago that he was touted for coming into the league being familiar with working in a pro style system at Pittsburgh. OC Brian Daboll looks to be running a West Coast offense where Peterman’s footwork and two years of prep at Pittsburgh should pay immediate dividends. He’s “looked sharp” throughout OTAs and minicamp so far and could be a dark horse to finish atop the team’s depth chart come September. Trading up to No. 7 overall to select Allen, the Bills made one of the more controversial picks of this year’s draft. There are some who believe in him as a first-round talent and others that believe he’ll be out of the NFL faster than you can say “Christian Hackenberg.” Allen spent a majority of the spring working with third-teamers, not getting any time with the first-team until late in minicamp. According to HC Sean McDermott, that’s part of the “developmental plan” they have in place for Allen, which focuses on easing him into first-team reps with as little pressure as possible. There’s no trial by fire here, but it does mean we could see an extended look at him in the preseason as he plays with the backups. In all likelihood, we may not find out who the Bills starter is until several preseason games are played. None of these quarterbacks look to be fantasy viable for redraft this year and expectations should be tempered if investing in any Bills offensive skill players.